This is the question that changed everything for me. It’s such a simple question. How many years do you want to work? Most people never think this way. When they do, the popular answers are usually “You work until you are 65” or “You work until you win the lottery”. Why do we spend so much time thinking about where we want to work, where we want to live, the car we want to drive, and the house we want to live in, but not this more fundamental question? How long do you want to work for?? The trend is pretty dramatic. Save the recommended 10% of your income and you’ll be doing better than the majority of the United States… but you’ll still be on track for a 40 year mandatory sentence. Up your savings rate to 65% and you could be free in less than a decade! The concept behind it is simple: when your annual investment returns cover your expenses, you’re done- you’ve reached financial independence! But how does this math work? What are the underlying assumptions? And how can it be independent of my salary? As an engineer, I like to fully understand the math behind charts like these before drastically changing my lifestyle. I decided to search for the underlying equation derivation online, and as it turns out, it isn’t easy to find. MMM discusses the result, but not the actual math. He defers to NetWorthify, which has a great calculator and ‘behind the math‘ page, but their final equation is totally wrong! I turned to Early Retirement Extreme, but even Jacob doesn’t do the full derivation in his book. For me, this was a “Challenge Accepted” moment! I’ll give you the final equation here, but head to the bottom of the post for the full derivation. Here it is, the early retirement equation. Plug in an expected market rate of return, a savings rate, and a withdrawal rate, and out pops the total number of years in your working career. Sounds great- but what values should you plug in? The FI community makes the case for a 4% safe withdrawal rate, or SWR, and I agree this is a great starting point for your FI planning. The 4% rule comes from the Trinity Study, which performed a Monte Carlo analysis withdrawing different amounts from portfolios across well over a century of stock market history. The results showed that 96% of the time, a portfolio with a 4% annual withdrawal rate lasted at least 30 years. Those are pretty good odds! The Mad Fientist wrote an excellent post about how the success of the portfolio is primarily predicted by the volatility in first 10 years of withdrawals, so you’ll want to build in some flexibility in your FI plans if you choose 4% withdrawals. Dropping to a 3% will hedge that volatility, but you’ll have to save quite a bit longer. 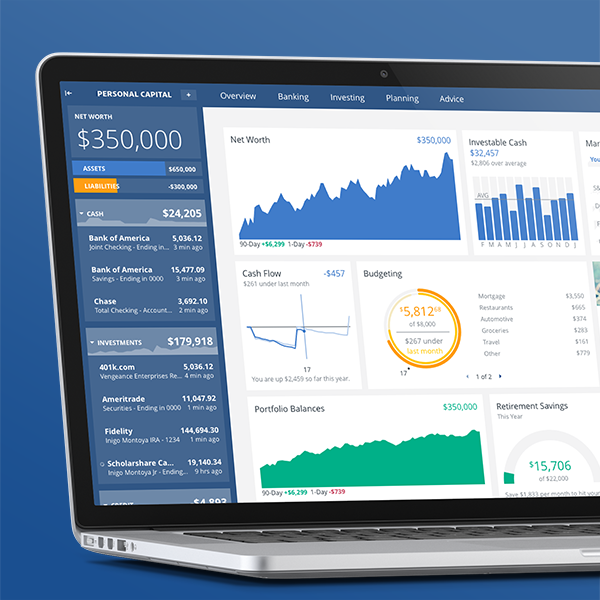 Choose a 5% withdrawal rate instead to reach FI quicker, but remember that this requires even more flexibility, particularly if your first 10 years of FI are rough market years. The 4% withdrawal rate, then, is a nice middle ground and is what I’m planning for my retirement withdrawals, so I can be your guinea pig. I’ll document my transition to FI and the flexibility required right here on this blog over the next year to two! Note that across the internet you’ll stumble upon many articles discussing why the 4% rule is flawed, and why many early retirees will likely fail. While some of the points seem valid, the writers are usually making two invalid assumptions: (1) early retirees will never earn another dime in their 50+ year retirement, and (2) their spending is completely inflexible. These assumptions may be true for traditional retirees, but are ridiculous for most of us in the FIRE community! The truth is that most FIRE types could pull 5% and still be fine. I’m not planning on sitting in front of my TV and ordering pizzas for the next 50 years. I’m using FI to transition to a lifestyle where I can work on creative and meaningful endeavors without focusing on income. After a few years, many early retirees end up making additional income in FI as a natural side effect of having the freedom to pursue meaningful work on their own terms. I think you’ll find this true of nearly everyone who has reached the milestone and quit their traditional job. Compound interest is a powerful thing. Numerous articles and even books exist on the topic. But there’s a problem with compounding: It takes a long time to get going! Here in the FI community, we don’t want to wait 20+ years for compounding to work its magic. 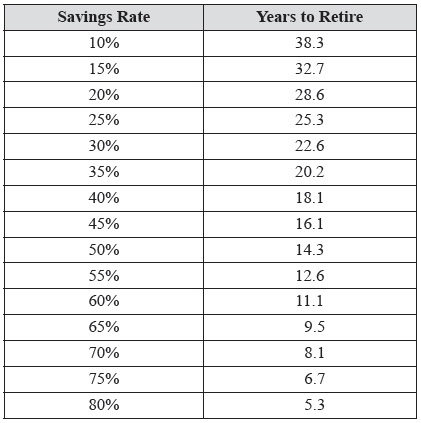 To retire in ten years or less, the most important number is actually your savings rate. We see that someone withdrawing 4% per year, earning 8% per year in the market, and saving 80% of their money each year can retire in 5.2 years. But what if we change our market rate of return down to only 2%? In the chart above, our retirement date only pushes forward about 8 months. The market rate of return matters a little for long term wealth preservation, but is practically insignificant during the wealth accumulation phase. What if we put our market rate back to 8% but lower our savings rate to 25% instead? Ouch- This pushes our retirement date out over 20 years! As you can see, the savings rate has much more impact than the market rate in determining your retirement date. This is good news, too, because unlike the market, your savings rate is completely within your control! Traditional advice is to save 10% of your income. How does that look in the chart above? The early retirement equation does a great job in showing how your savings rate is the single most important factor in determining how many years are in your working career. Recent college graduates just entering the workforce can use this powerful tool to literally plan how long they’d like to work. For those like myself who have made bad financial decisions for years and need a financial 180, changing your views on lifestyle and spending is difficult. It is almost ‘common knowledge’ that times are always tough, and saving money is always an impossible challenge. But the truth is that in 1st world countries like the U.S., at almost any income level, you can save 50% of your income if you really want to. Yes, even on a teacher's salary! What it requires is for you to change your thinking about money: Most people think a 2500 square foot home and two to three new cars in the driveway is normal, or worse, something they deserve. Same with eating out at restaurants multiple times per week. When you realize the opportunity costs, you realize these purchases are actually fancy luxuries! Start cooking at home! Sell those new cars! Downsize that new house! Once you change your thinking, you can challenge other norms as well. Commuting an hour to work? Nope, that's a luxury you can’t afford. 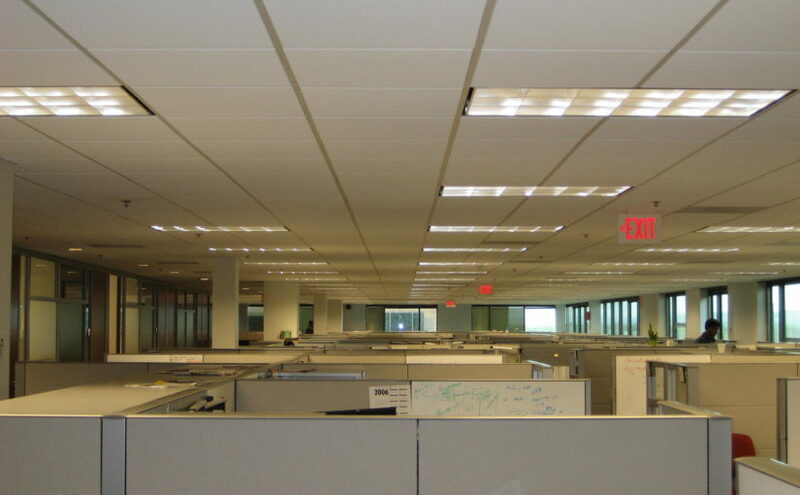 Move closer to work. Too expensive? Move to another state. Can't? Change careers. Get creative! There are so many options to increase your savings rate, and the opportunity costs for those dollars are enormous! It's only when you tighten constraints and shut down all these options that the pessimistic complaint of “I could never save 50%” comes true. OK. You get it. You need to save more. But once you do, where do you put your money so it can grow? CDs? The stock market? The real estate market? 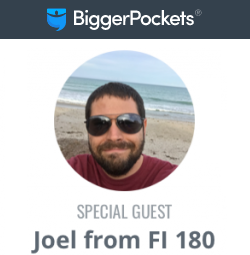 All this and more… on the next Financial 180! Bonus reading material for those interested! I couldn't find this derivation anywhere else online, so I figure I'm adding some value deriving it here. Let’s start with two equations you may remember from high school: The compound interest equation, and the annuity equation. Where j = annual income, a = annual savings (same as in equation 2), w = withdrawal rate, and F is our Future Portfolio Value from equation 3. We need one final equation so that we can express things in terms of savings rate. 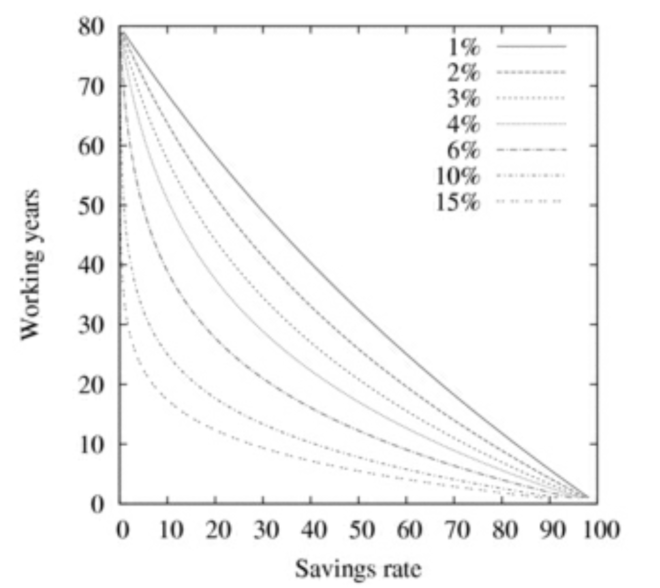 This is equation 5, which simply states that savings rate is equal to annual savings divided by annual income. And you should get this result: 4.03003. This means you need to work for 4 more years if you have an 80% savings rate, a current portfolio value of $100K, and earn $100K a year, with a market rate of 8% and a withdrawal rate of 4%. How did they calculate these numbers? By plugging into equation 6 above, we can now confirm they assumed a 4% SWR and an 8% market rate of return. If you've read this far, you must be as passionate about this stuff as I am… Cheers! *This will probably only impress your really cool friends. I’m impressed! I must be really cool. Thoroughly impressed as well! I <3 math! Keep the posts rolling, just like your savings snowball! Thanks John, glad you are enjoying the content! Let me know if there are any topics you are interested in me covering more in depth. Very impressed with the math and great to see it tested! Our goal is to save 50%+ of pre tax income this year with a goal of achieving FIRE. Agree we need to start reframing how we think about saving and redefining needs vs wants. Thank you! I’ve been looking for this equation everywhere! I love equation 6 because it answers the question: How long from NOW until FI? This is much more useful to me than all of the tables that only answer the question: How long from ZERO until FI. I just love your awesome brain, Joel!